In each of the first two game of Robert Morris’ three-game Atlantic Hockey quarterfinal playoff series with Bentley, the deciding goal was scored with just minutes remaining in the game, with the Falcons taking advantage of a late goal to win Game One on Friday and Robert Morris’ Mike Louria scoring a late-game winner in Game Two on Saturday. In the deciding Game Three on Sunday, the back-and-forth battle went all the way to the wire and then some, as the teams finished 60 minutes of regulation hockey knotted a two apiece. Freshman forward Justin Addamo lit the lamp for the golden goal when he pushed his way toward the Bentley net after an offensive-zone faceoff, and slid the puck under the glove of Bentley netminder Aidan Pelino for a 3-2 victory that will send the Colonials to the AHC semifinals for the sixth consecutive season. The winner came 16:04 into overtime, when Bentley’s Brendan Hamblet won a faceoff in front of Pelino, but Addamo when forward, got the puck, pushed his way to the front of the net and sent it to back of the net. Addamo’s goal finished yet another closely fought battle. In the three-game series, no team had more than a one-goal advantage. Bentley started the scoring on Sunday, with Game One hero Jakov Novak beating Francis Marotte at 3:05 of the second period. Robert Morris answered with a Luke Lynch goal at 12:22 that was assisted by Alex Tonge and Nick Prkusic. The goal was Lynch’s 10th of the season and his 30th point, the second straight year the Shaler native and Pittsburgh Penguins Elite and Johnstown Tomahawks alum reached those milestones. In the third period, the Falcons pulled ahead once again when Drew Callin fed Hamblet right on the doorstep of the RMU goal to give Bentley at 2-1 advantage. 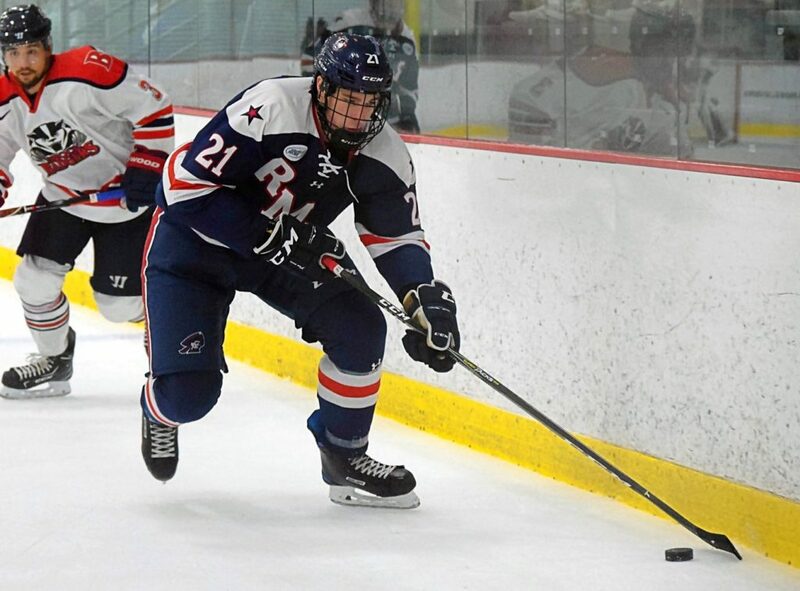 That advantage was short-lived, though, as just 51 seconds later, Robert Morris freshman Aidan Spellacy went right to the goal mouth and got a second-chance marker past Pelino to even the game once again. Robert Morris will play first-place American International in the first semifinal at HarborCenter in Buffalo, New York. Faceoff is scheduled for Friday at 4:35 p.m. The later semifinal will feature Niagara and RIT.